If you live in an area this is susceptible to extreme winters, you possibly already have a few of the crucial wintry weather portions that one makes use of. These include a diffusion of factors like scarves, jackets, thermals, gloves and any other sort of tools. Those shape the necessities of winter put on, however, the more distinguished aspect is the material that they're made from. Clothing this is preferably fabricated from thicker material is a popular recommendation for the iciness. Carrying a fleece or leather jacket is likewise something that is going well with the entire look. Your cap and scarves may be made either of wool or of fleece material, whichever you select. 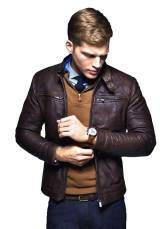 William Jacket is one of the leading and trusted online stores on the internet that provide his customers with best and affordable leather jackets.William jacket introduces the Colin Firth Kingsman The Golden Circle Leather Jacket.This jacket is inspired by the most famous movie “Kingsman the Golden-eyed” worn by Colin Firth. It is made up of high-class suede leather. With its soft shearling inside it is more comfortable at any temperature. It has brown color with four front pockets. It has open hem cuffs and wide and comfortable fur collar.Eggsy Taron Egerton Kingsman The Golden Circle Orange Smoking Tuxedo Jacket is also a unique and elite class jacket. That jacket has been revealed on finest English movie Kingsman the Golden Circle where Taron Egerton has depicted the main character as Gary Eggsy Unwin. This jacket is made up of velvet material which will give you warm feeling whether the temperature goes in negative. It has viscose lining inside the jacket for inner protection of your body. Its wide peak lapel collar will make you unique in public. It has one button closure with buttoned cuffs.Channing Tatum Kingsman The Golden Circle Denim Jacket is one of the most sold out jackets of our store. This leather-based jacket is inspired by the movie “Kingsman The Golden Circle”. Channing Tatum has played the main role in the movie, he used to wear this Kingsman The Golden Circle Denim Jacket. This jacket is made up of soft denim material which will give you comfort and ease. With its blue color, you can catch anyone’s eye in any kind of gathering. Channing Tatum jacket has an ankle-length sleeve, an appropriate sleeve which is devoted with buttoned clasp cuff.